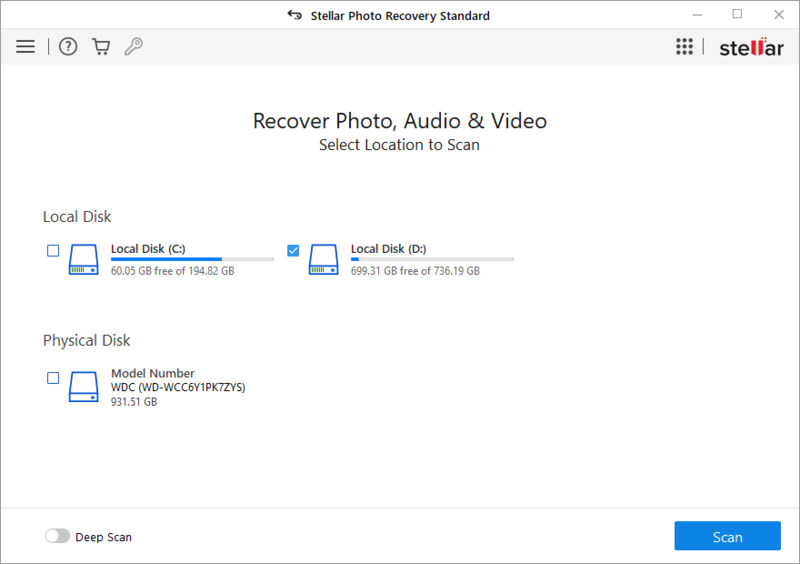 Stellar Photo Recovery is an advanced photo, video, and audio recovery tool for complex data loss situations. It delivers a high success rate and boasts of an array of powerful features to facilitate recovery from large-capacity storage drives up to 4 TB. With it, you can even recover media files from reformatted drives or corrupt storage media. The software easily restores deleted photos and videos from SD card, memory card, USB pen drive, and CD/DVD. It is the best choice to recover camera RAW files as well as raster and vector images. The software supports all popular brands of smartphones, cameras, and drones such as Canon, Nikon, Sony, Samsung, DJI, Parrot, etc. Easy-to-navigate interface, customized scanning process, flexibility to save recovered files at a desired location, and recovery of all known and unknown file formats make Stellar Photo Recovery a must-have software. The fast scanning speed restores thousands of photos, videos, and music files in just a few minutes. Plus, you get back your photos and videos with their original date/time stamp along with the resolution, camera name and model, if available. The software maintains the original quality of the recovered photos and videos. Other distinct features include preview of the found media files; Deep Scan - in case you do not get the desired results in an initial quick scan; and provision to save scan and resume recovery later at your convenience. Furthermore, it lets you protect photos and videos stored on a drive that has developed bad sectors. You can create an image of the storage device, save it, and perform recovery from it at any time. Video tutorials and user guide are available along with a highly responsive 24X5 customer support. Stellar Photo Recovery is 100% secure and safe to download. Download the free demo version to try out its superior data recovery capabilities before buying.